Raw sauerkraut is a brilliant probiotic food, rich in enzymes and nutrients — and it tastes much better than the pasteurized stuff in the cans from the grocery store, which are devoid of nutrients anyway! The first time I ever made sauerkraut, I was surprised at how delightfully tangy and crunchy it was, as opposed to the unpalatable sour and limp stuff I had tried before. 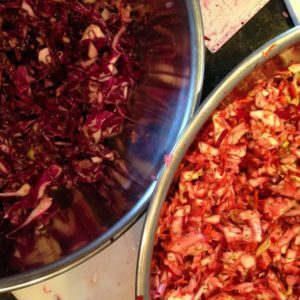 It’s very simple to make, and if you’re wanting to get started with fermenting veggies, sauerkraut is the place I recommend you start. I work at a health food store, and one day a lady came in asking if we sold kombucha SCOBYs. I told her I made kombucha, and that I would gladly give her a SCOBY. Though I wasn’t expecting it, she came back to the store later and gave me some fresh organic kale and purple cabbage from her garden! I decided to try to make a sauerkraut with the cabbage. To this day, I think it’s still the best sauerkraut I’ve ever made. I brought some to my coworkers and one of them said it was the best sauerkraut she’d ever had, too! I wanted to use green apples to sweeten the sauerkraut a little, and I knew that cabbage, apple and pork sausage make a good flavor combination (like in the suggested adaptation to my Ukrainian meatball recipe), so I was inspired to use fennel to impart that anise flavor that I wanted. This stuff is THE BUSINESS served with pork. It’s also good as a topping for grass-fed hot dogs, added to a salad, or just eaten on its own with a fork from the container while standing at the fridge (not that I’ve ever done that. Ahem). The best thing about this sauerkraut is that the colors mesh together and the whole batch turns the most beautiful magenta color! A tangy and crisp raw sauerkraut, excellent served with pork. Put all the vegetables into a large bowl. Sprinkle the salt over the top of the veggies and massage the vegetables with your hands. Set the bowl aside for 15 minutes to let the salt draw some of the moisture out of the cabbage. Continue to massage the cabbage until the cabbage is wilted and you start to see water pooling at the bottom of the bowl. Fill up a wide-mouthed half gallon mason jar with a couple handfuls of the cabbage and press it down firmly with your hand or with a sauerkraut pounder. Do this, layer by layer, until the cabbage is all firmly packed down and the brine comes above the vegetables when you press down. Use the cabbage leaf to cover the vegetables and use a shot glass or other weight to weigh it down so the brine covers all the vegetables. 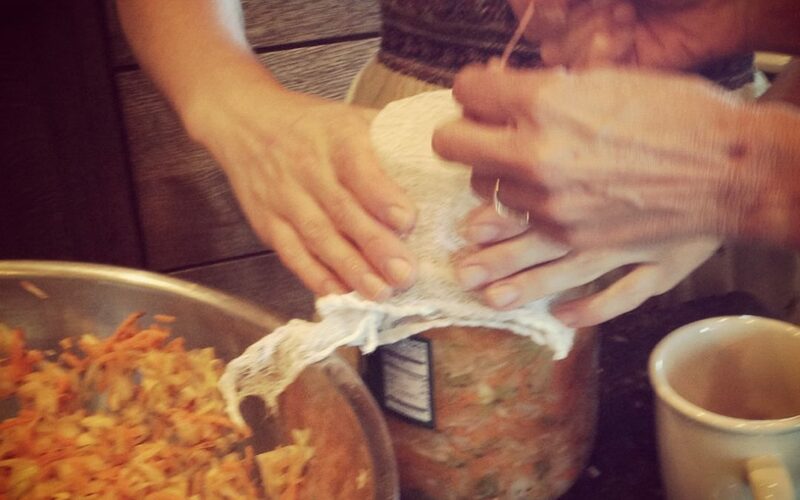 Cover the jars with cheesecloth, using a rubber band to secure it. Put the jar on a plate to catch any spill-over. Put the jar somewhere at room temperature where it won't be disturbed. Let it sit for 3-4 weeks, checking every once in a while to make sure everything is still below the brine level. Once you've tasted it and it's to your liking, put it in the fridge with the lid on. My work also sells a particular brand of sauerkraut that reminds me of borscht because it’s made with all the same ingredients: cabbage, carrot, beet and dill. Months ago, I decided to try to recreate it. The first attempt was a massive failure! I used raw garlic, and too much of it, because it was unedible. I actually threw it out, which I almost never do. I decided to try it again when I made the cabbage/apple/fennel sauerkraut, and this time I left the garlic out, and it was much better. If you like garlic, probably one small clove would be a nice addition, but I wouldn’t do any more than that, unless you want to be warding off vampires or something. A tangy and delicious raw sauerkraut salad made with cabbage, beets, carrots and dill. Put all the vegetables into a large bowl. Sprinkle the salt over the top of the veggies and massage the vegetables with your hands. Set the bowl aside for 15 minutes to let the salt draw some of the moisture out of the cabbage. Continue to massage the cabbage, until the cabbage is wilted and you start to see water pooling at the bottom of the bowl.